Bali 3/8" Single Cell Honeycomb Cellular Light Filtering Shades combine a sophisticated design with residential energy efficiency and sound insulation material that surpasses any other contemporary window treatment. The insulating cell shades prevent heat transference to help lower energy bills year round. Coordinate with VertiCell™ Vertical Cellular Shades to add matching style to patio doors or wide windows. 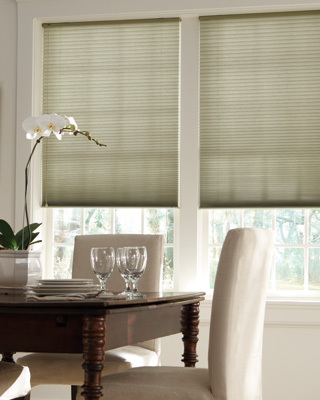 All fabrics are now available in cordless cellular shades to reduce accident hazards in homes with children or pets. The New Bali Collection of Cellular Honeycomb Shades contains inspiring fabrics and exciting colors. Add a decorative cornice or valance styles to virtually any contemporary window treatment to create a unified, complete appearance. Choose from a diverse assortment of natural paints and stains as well as coordinating fabrics. Width 90"-180" must be two or three shades on one headrail. Width 180"-192" must be three shades on one headrail. Option allows you to lower the shade from the top or raise it from the bottom to maintain privacy while permitting natural light to enter. Perfect for bedrooms and bathrooms, bottom up/top down shades are available in corded and cordless styles. Use multiple shades on one headrail to accommodate wide windows or patio door that can't be covered by a single window treatment. A single headrail makes installation easier and adds a unified look to two or three independently operable window treatments. The controls for right shade will be installed on the right, and control for left shade will be installed on the left side of the window. Please call our customer service for more information. You may use a Five Channel remote control to operate upto five motorized shades in one room. Extension Brackets are used to project the shade out to clear the window sill. It is mostly used for outside mount.